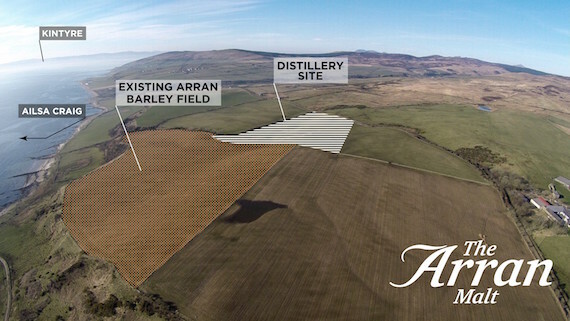 Drinks International visited the proposed site of its new £10m facility near the village of Lagg, on the south coast of Arran, which will be operational in August 2018, producing a new peated single malt whisky. The new distillery will have a capacity of 800,000 litres of alcohol but will produce around 200,000-250,000 litres until the company’s new brand is established. Isle of Arran Distillers’ managing director Euan Mitchell also revealed plans to double production at its existing Lochranza distillery - which produces The Arran Malt - from 600,000 litres of alcohol to 1.2m litres. The Lagg distillery will solely produce the new, as yet unnamed, heavily peated (50ppm) single malt in order to tap into the peated whisky market, currently dominated by Islay brands and Skye’s Talisker. It will be around 2024 when the first spirit from the new Lagg site is launched, but Mitchell has set his sights on a sales target of 50,000 9-litre cases once the brand is established. The first Lagg product will not carry an age statement but age statements will eventually be introduced to the brand’s core expressions. While there will be some crossover between the markets the two distilleries' whiskies operate in, the new peated whisky will be pushed towards the company's under-exploited markets.